The Japanese Aircraft Carriers Akagi and Kaga defined the 1st Carrier Division and included Destroyer Division 7 : Akebono, Ushio. 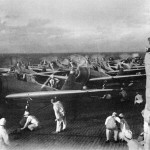 The 1st Carrier Division was part of the 1st Air Fleet (第一航空艦隊 Daiichi Kōkū Kantai). This unit was pioneered in the world and the primary carrier fleet of the Imperial Japanese Navy (IJN). 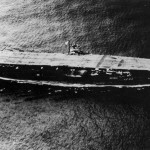 It consisted of the largest group of naval aircraft and aircraft carriers that participated in the attack on Pearl Harbor and was the world’s largest aircraft carrier fleet. The 1st Carrier division was sunk in the battle of Midway, June 1942. The Akagi aircraft carrier illustrated in Hasegawa model kit box. Interestingly, when it was constructed the Akagi had three aircraft flight decks and no superstructure. 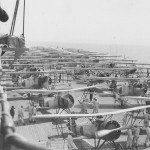 When the flight-deck operational techniques evolved in the 1930s, this unusual setting posed problems for effective operations. Due to this, major modifications were done from October 1935 to August 1938. As a result, the aircraft carrier Akagi was transformed into a single full-length flight deck, enlarged the hangar space, a third lift was added and a true carrier island was built on the port side of the flight deck. Moreover, antiaircraft armament was also included. The Akagi sailing in 1940. 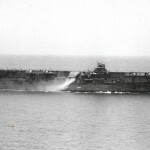 The Akagi became soon the first true fleet carrier and together with the carrier Kaga acted as a test bed for the development of Japanese naval air doctrine during 1930s. The aircraft carrier Akagi served as flagship of Carrier Division 1 and as a flagship of the First Air Fleet from April 1940 onward. The aircraft carrier Akagi joined operations in China and in every major carrier campaign during the opening months of the Pacific War. The Akagi was scuttled on 5 June 1942 during the Battle of Midway, after receiving two bomb hits that induced explosions and uncontrollable fires. Because of the limitations imposed by the Washington Naval Treaty on capital ship construction, the works on the battleship Kaga were stopped in 1922. 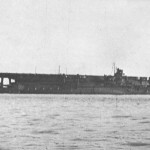 As a consequence of the destruction of the then-building Amagi in the Tokyo earthquake of 1923, the Kaga was chosen to replace her for completion as an aircraft carrier. Modifications included revisions of the armor layout to conserve top weight. She was launched in 1925 and in 1928 was commissioned, three years later, after an extensive fitting-out period and carried 90 planes . 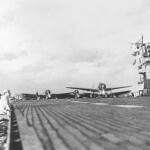 Similarly to the carrier Akagi, the aircraft carrier Kaga had three aircraft flight decks and no superstructure as built. After only six years in service, the Kaga underwent a major refit beginning in June 1934. Her hull was lengthened, a single full-length flight deck erected, hangar spaces enlarged, a third lift added, and an island built on the starboard side of the flight deck. The carrier Kaga heavy antiaircraft armament was upgraded and light AA was also added. The Kaga aircraft carrier illustrated in Hasegawa model kit box. The aircraft carrier Kaga participated in actions againts China and in every major battle during the opening months of the Pacific War. The aircraft carrier Kaga was sunk on 4 June 1942 during the Battle of Midway, as the result of four bomb hits producing fires and induced explosions. Impressive image of Kaga’s funnel. Kaga’s deeck in 1937 with Aichi D1A, Mitsubishi B2M, and Nakajima A2N aircraft.